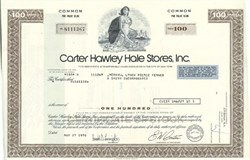 Pack of 100 Certificates - Carter Hawley Hale Stores, Inc. (Became Federated Department Stores) - Price includes shipping costs to U.S.
Home > Certificate Quantities for Educators / Business Promotions > Pack of 100 Certificates - Carter Hawley Hale Stores, Inc. (Became Federated Department Stores) - Price includes shipping costs to U.S. Beautifully engraved certificate from the Carter Hawley Hale Stores, Inc.. This historic document was printed by the Jeffries Banknote Company and has an ornate border around it with a vignette of an allegorical woman in front of a city skyline. This item has the printed signatures of the Company’s Chairman of the Board (E. W. Carter) and Secretary. This item has the printed signatures of the Company’s President and Secretary. The Carter Hawley Hale stores was the largest retailing chain on the West coast, and sixth largest in the country in 1984. Based in Los Angeles, its nationwide empire stretched from trendy LA bargain basements to tiny Fifth Avenue boutiques, with a bookstore chain in between. Operating under the CHH flag were Bergdorf-Goodman, The Broadway, Contempo Casuals, Emporium-Capwell, Hole Renfrew, Neiman-Marcus, Thalimers, Walden Books, John Wanamaker, and Weinstock’s.